With the ThinkPad 13, Lenovo presents a very elegant business device with a 13.3 inch screen that is different than other ThinkPads. 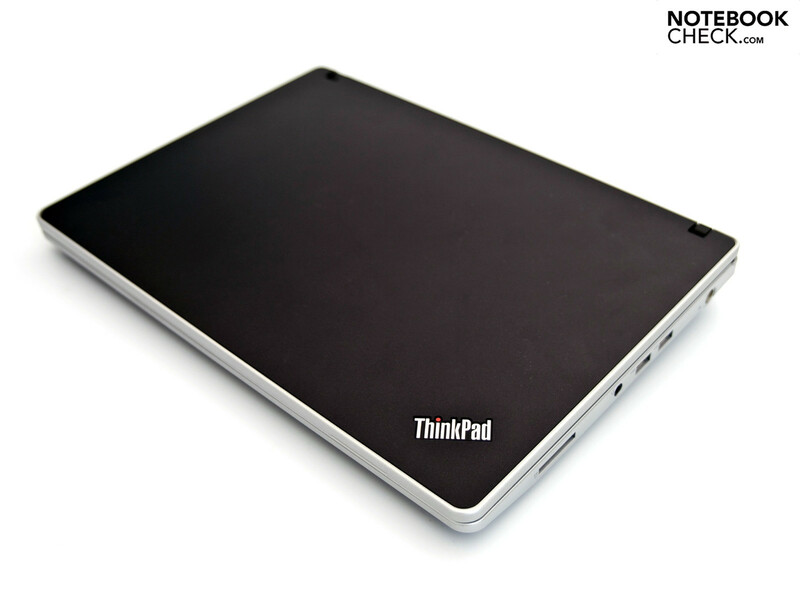 Aside from an elegant black, the ThinkPad Edge 13 is also available in charcoal and red. 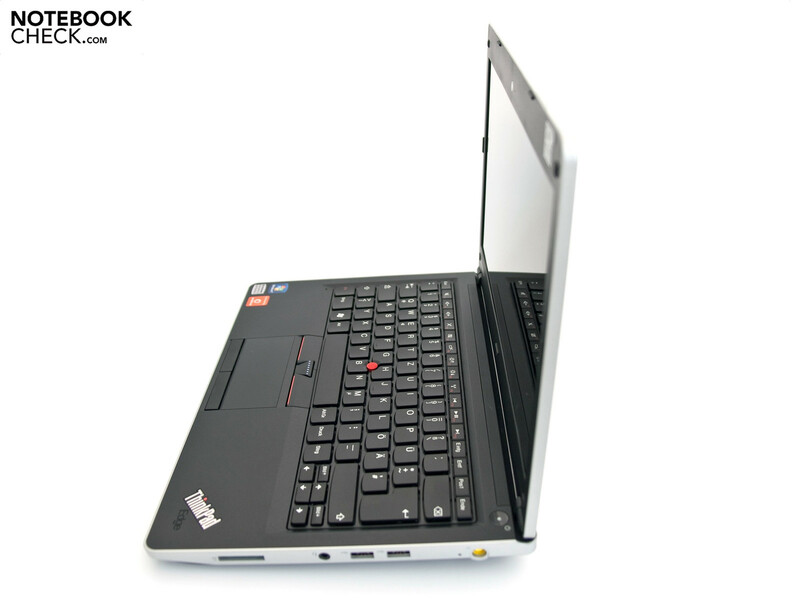 Lenovo's ThinkPad range stands above all for good quality and a high durability. 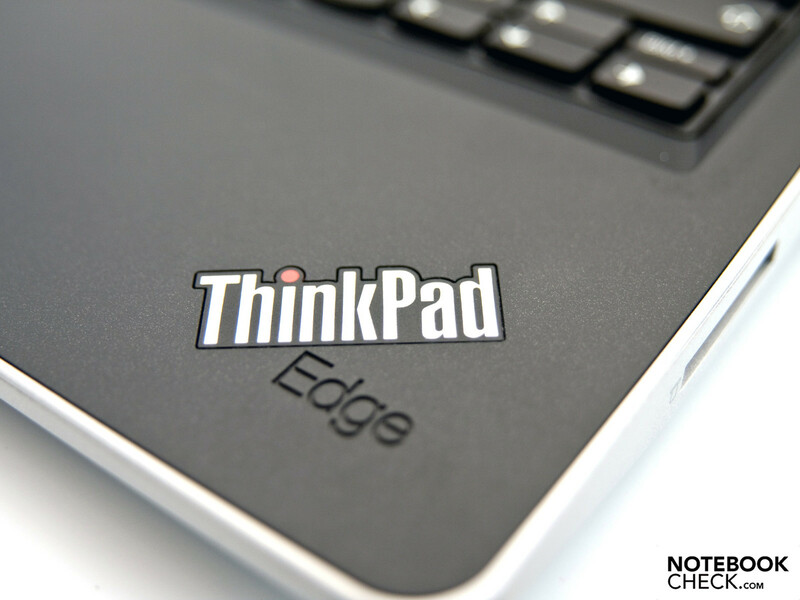 Read about how the ThinkPad Edge 13 (NUE2UGE) manages in detail in this review. 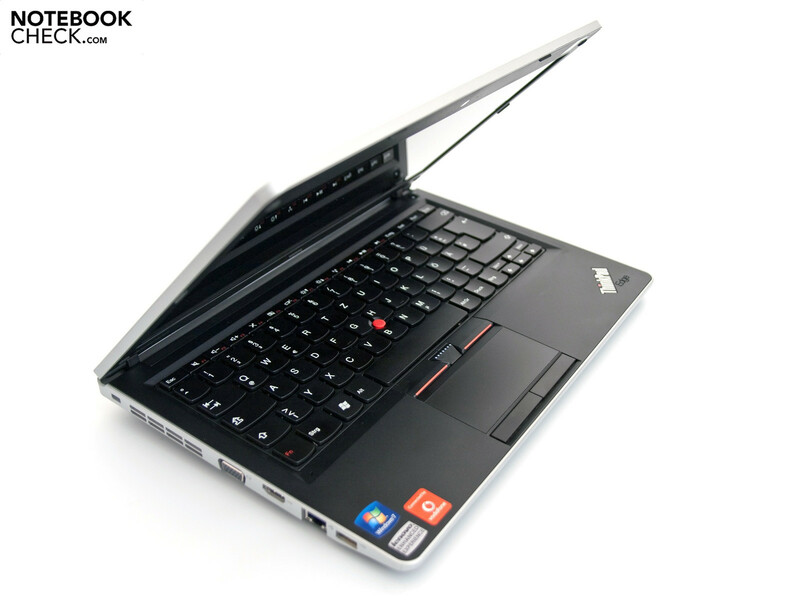 You'll currently find three different ThinkPad Edge 13 model on Lenovo's German website. 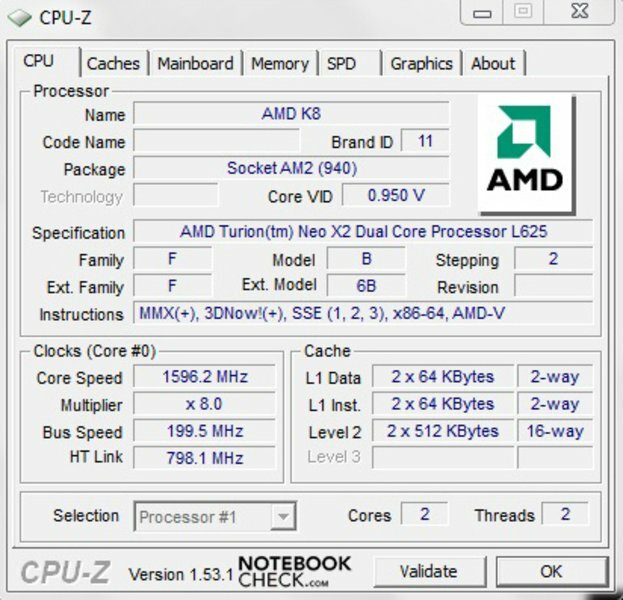 The two lower priced models are equipped with an AMD Turion Neo X2 L625 dual-core processor and an ATI Radeon HD 3200 graphic. The most expensive model works with an Intel Core 2 Duo SU7300 processor and an Intel GMA 4500MHD graphic unit. 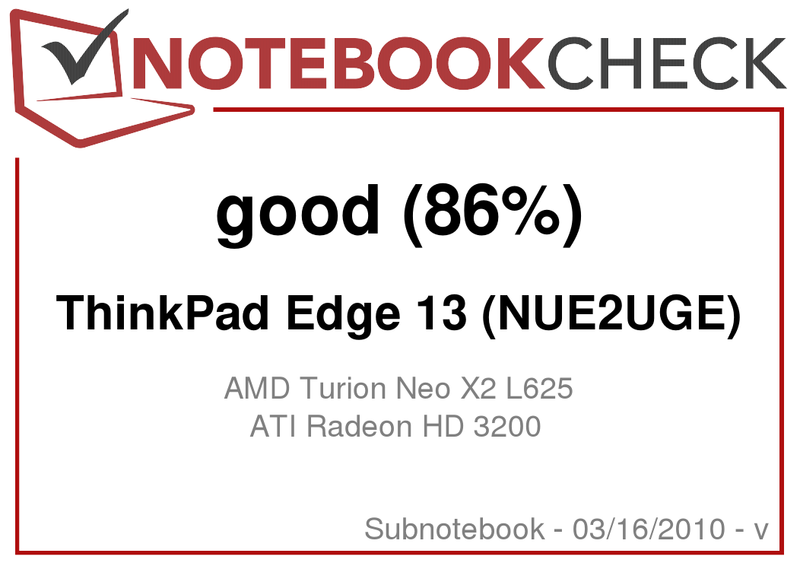 Our prototype is the Lenovo ThinkPad Edge 13 NUE2UGE with an AMD Turion Neo X2 L625 processor (1.6 GHz) and an ATI Radeon HD 3200 graphic unit. The prices for the new ThinkPad Edge 13 start at 678 euro (MSRP) and end by about 828 euro. Our charcoal colored prototype with an integrated UMTS broadband modem from Qualcomm costs around 737 euro (MSRP). The ThinkPad Edge 13 presents itself as very reserved, as expected. The design is almost minimalistic and forgoes on high-gloss or chrome components. A silver trimming runs around the device, which gives the design a more modern look. Our prototype is made in an elegant charcoal color. Lenovo also has a black and striking red model. 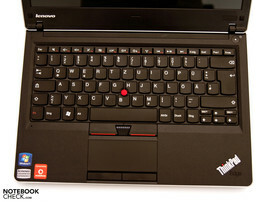 A ThinkPad logo is found both on the wrist-rest and display lid. The lighted dot on the logo's "i", as already has been seen in the SL range, is an eye-catcher. 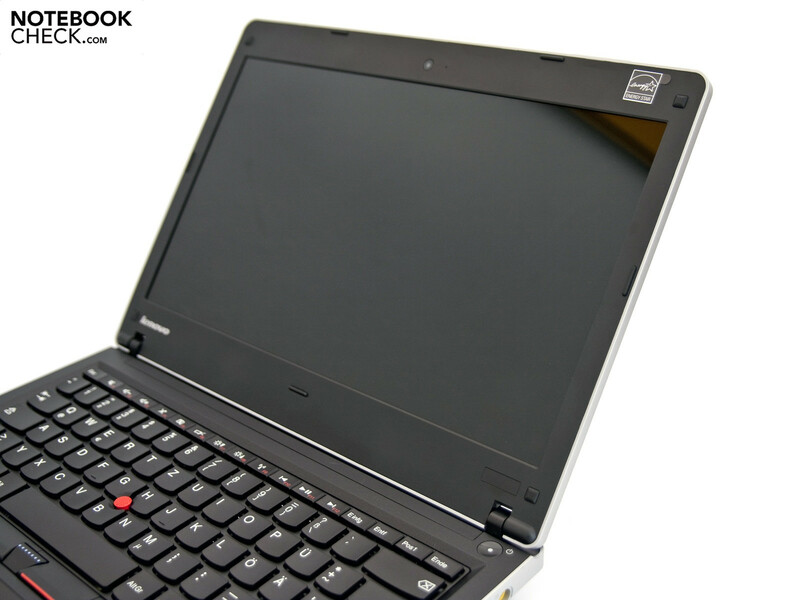 Overall, the Edge 13 is a very simple, but at the same time elegant subnotebook, which can distinguish itself from other ThinkPads in terms of looks. The case's workmanship and finish are impressive. There aren't any faults in the finish or irregular gaps to be found. There's nothing to complain about in terms of the case's pressure stability and torsional stiffness. The subnotebook weighs about 1.8 kilograms (including the inserted 6 cell battery) at a size of 33.2 x 22.8 x 2.5 centimeters (w x d x h). That's a good rate for a 13.3 inch device. The latest Apple MacBook weighs about 400 grams more. Lenovo can't build in an internal optical drive due to the low construction height. 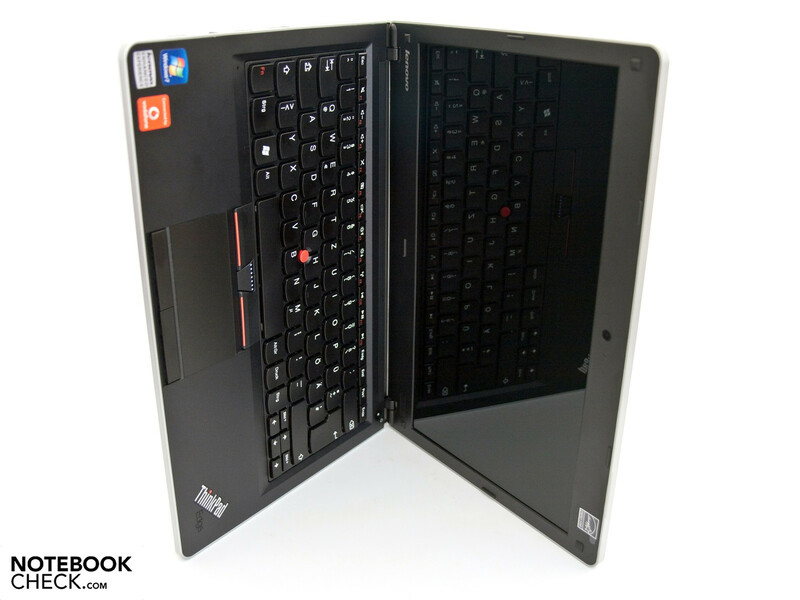 A big advantage is Lenovo's very good display hinges. They bid a good grip despite their small size. The applied hinges make a durable and almost indestructable impression due to the good manufacturing. A further advantage is the maximum possible opening angle of almost 185 degrees. Unfortunately, the base unit has to be held in order to open the device. The given connection variety is quite circumferential for a business device and you'll find a few highlights. 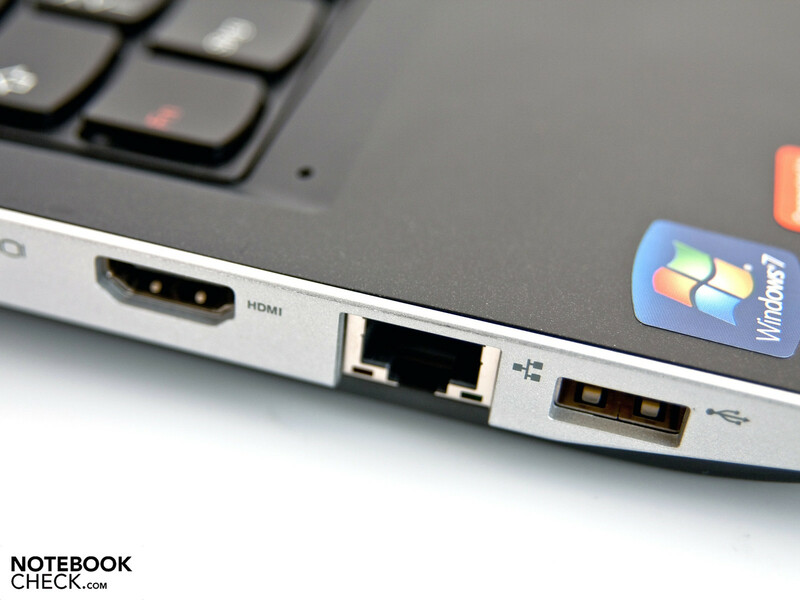 A USB 2.0 port, a gigabit capable RJ-45 network socket, an HDMI port, an analog video-out (VGA) and a Kensington lock are found on the device's left. Due to the integrated ATI Radeon HD 3200 graphics, HD videos can be rendered. An HDMI port has been integrated for outputting this media. This connection makes it possible to transmit image and audio with one cable. Across, on the right, there are two further USB 2.0 ports, a 5-in-1 cardreader that can read SD (SDHC), MMC, MS, MS Pro and xD memory cards, the DC-in and an audio in and out. 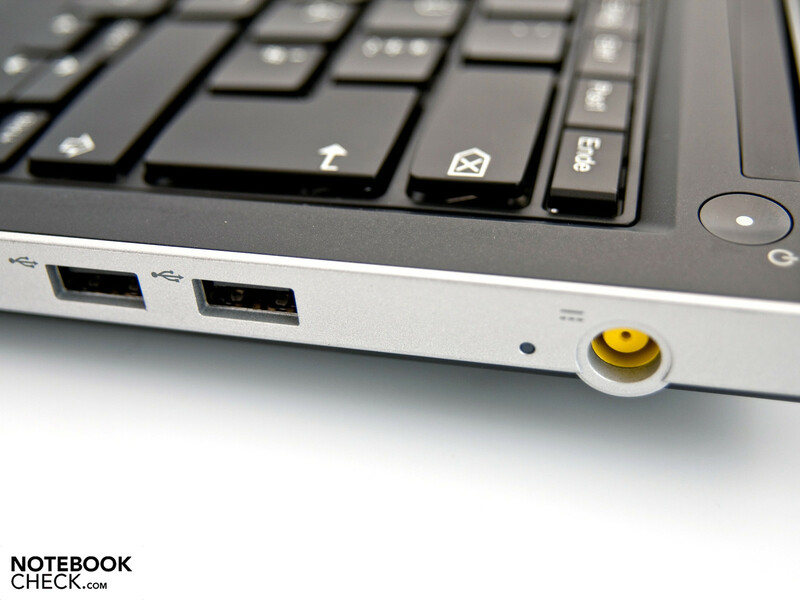 Lenovo has combined two jacks in one with this socket. We would have preferred a separate socket for both the input and output, as only a few headsets support this connection. Lenovo hasn't built-in any connections on the front. Merely two little stereo loudspeakers are underneath the silver trimming. The rear is also unfettered from connections because the big 6 cell battery claims this area for itself. 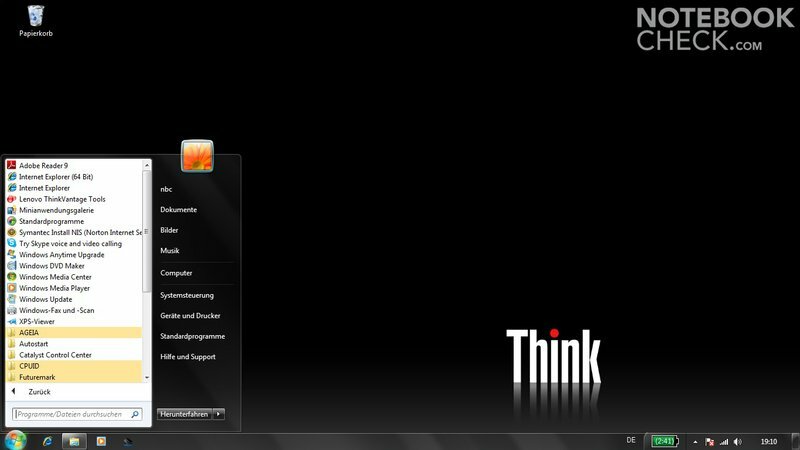 If you look at the bottom, you'll quickly notice that this ThinkPad doesn't have a port for a docking station. 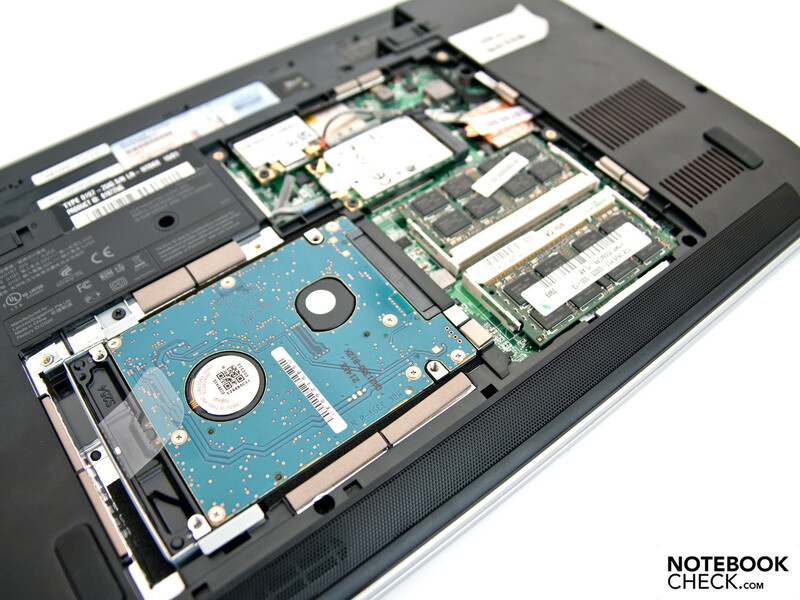 Instead, there is a big maintenance cover under which the hard disk, the RAM and the modules for mobile technology are concealed. 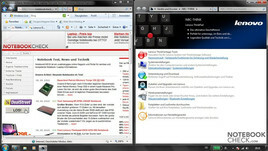 Overall, Lenovo has done a good job with the interface distribution. 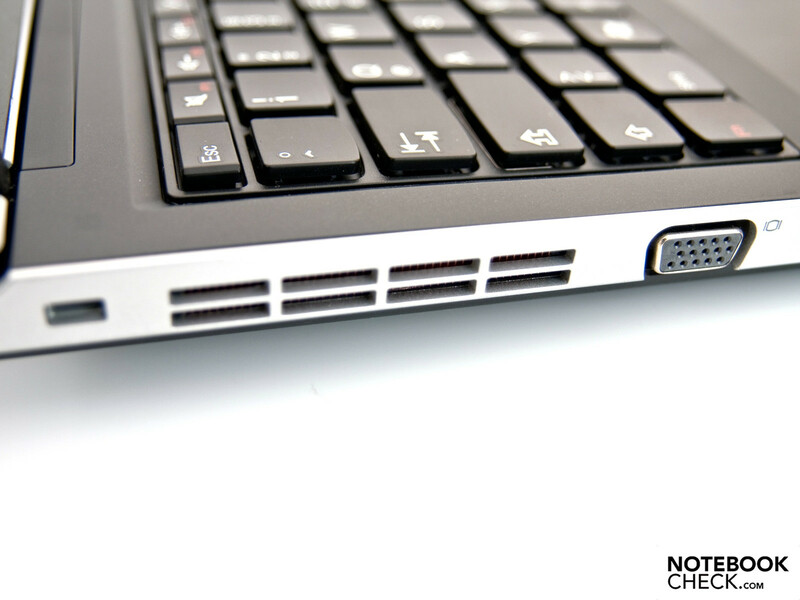 We noticed the 5-in-1 cardreader and HDMI port positively. Instead of one jack for audio in/out, we would have preferred two single sockets. An ExpressCard slot 34 for extension cards and a port for a docking station would also have been desirable. 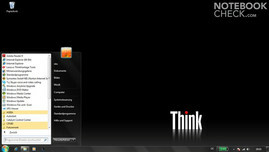 The communication options in the Edge 13 are comprehensive and Lenovo has considered everything. Connections to Ethernet networks are possible via the Realtek chip set and the correlating RJ-45 port. An own module is responsible for wireless connections, and which supports WLAN 802.11 b/g/n. The biggest advantage is the integrated Gobi 2000 from Qualcomm (HSDPA/HSUPA, downlink 7.2 MBit/s, uplink 5.76 MBit/s), which makes internet connections via the broadband modem. 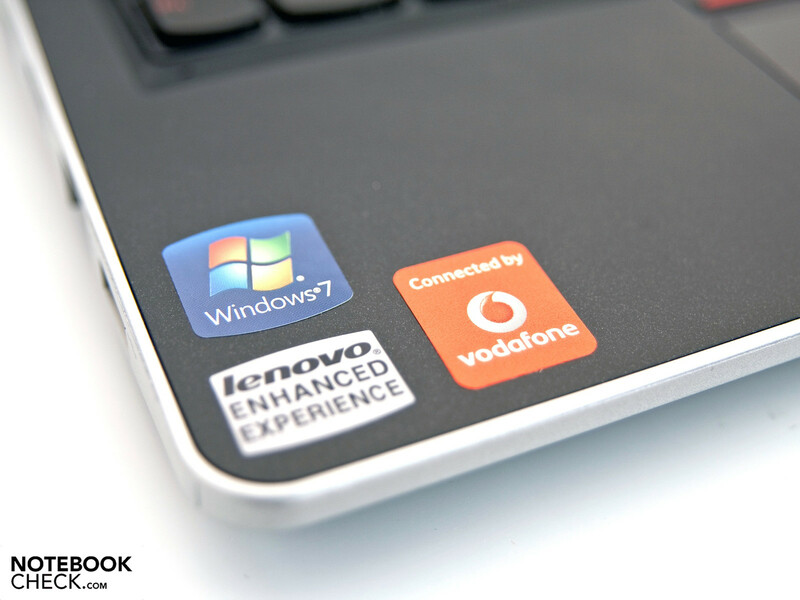 Lenovo collaborates with the mobile provider Vodafone Germany in this point. Video conferences with business partners or friends are possible with the integrated webcam. Additionally, Bluetooth 2.1 +EDR for synchronizing data of mobile devices, like smart phones or PDAs, are integrated. 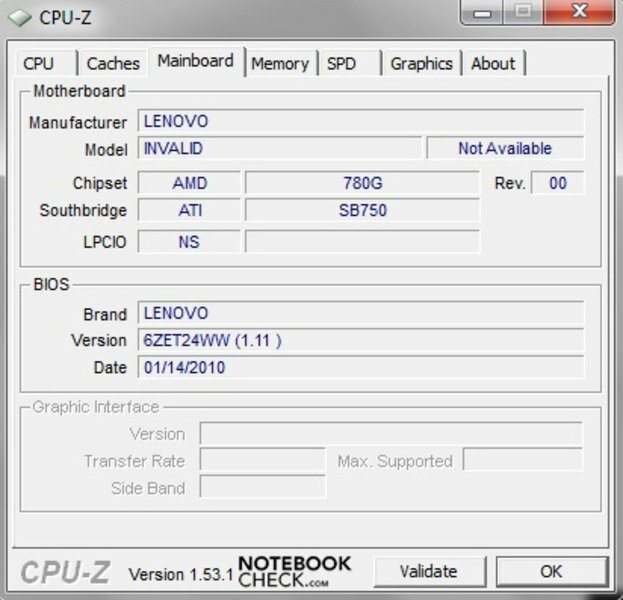 Lenovo uses Windows 7 Professional in its 64 bit version as the operating system because this version has extended settings in terms of network management and administration. The built-in 4 GByte RAM can additionally be addressed fully and the system bids a good performance. Aside from the operating system, a few extra programs have been pre-installed. You'll find Adobe Reader 9, Skype, Symantec Norton Internet Security (trial version), Microsoft Office Home & Student (trial version) and various software from Lenovo. The scope of delivery unfortunately only includes the most necessary at a price of 737 euro (MSRP). Aside from the subnotebook, you can get the correlating adapter with cable, the 6 cell battery and a few manuals. You won't find software or recovery DVDs. The recovery medium can be created with a special tool. We would have expected a few more accessories in the scope of delivery. In return, Lenovo's offered optional supplies are very extensive. Lenovo has the correlating adapter (132 euro), batteries (119 - 141 euro), cases and covers (23- 92 euro), keyboards and mice (12 - 86 euro), displays (187 - 357 euro) and a lot more for the Edge 13. 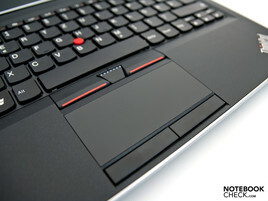 The ThinkPad edge has been given a simple chiclet keyboard, which is kept in the standard layout. The keys have a sufficient size and have a pleasant pressure point and stroke. A special feature are the convex key form, due to which you have a pleasant feel at typing. 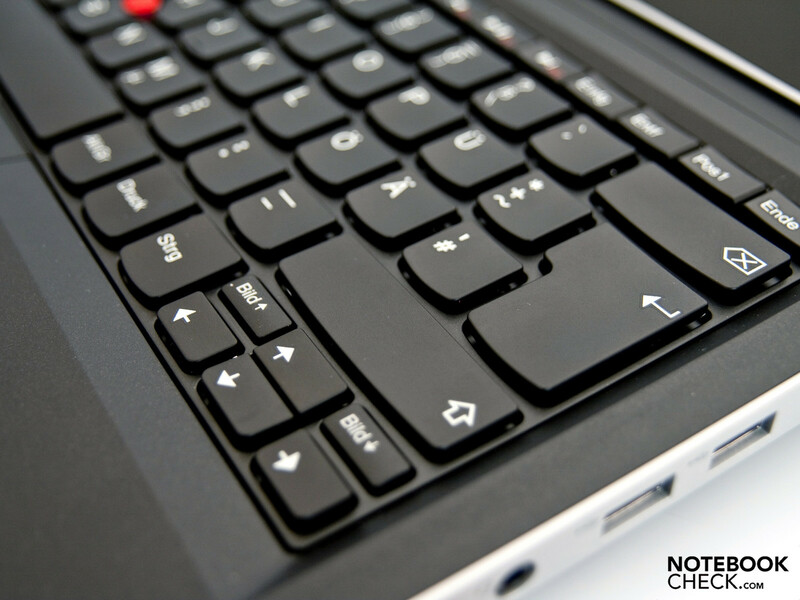 The generous layout is convincing and the keyboard's design harmonizes with the overall appearance. 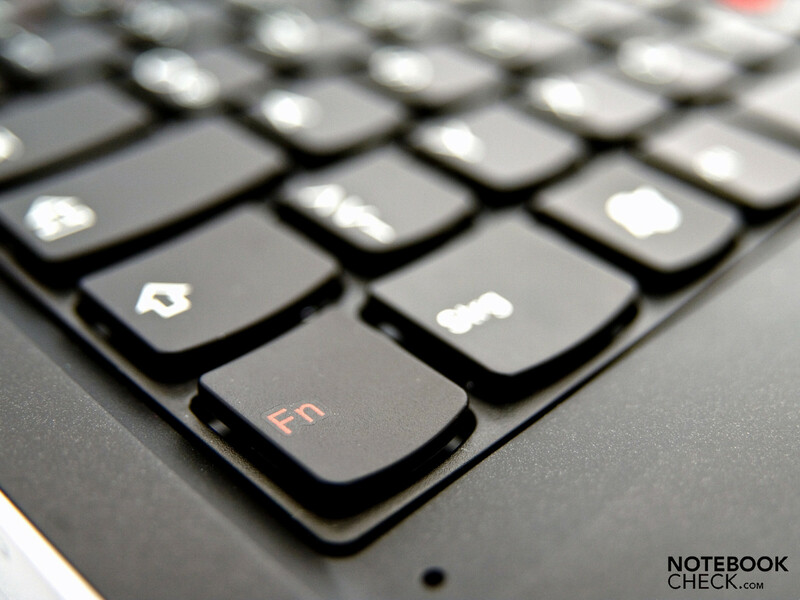 The FN function keys are highlighted in a dark red. 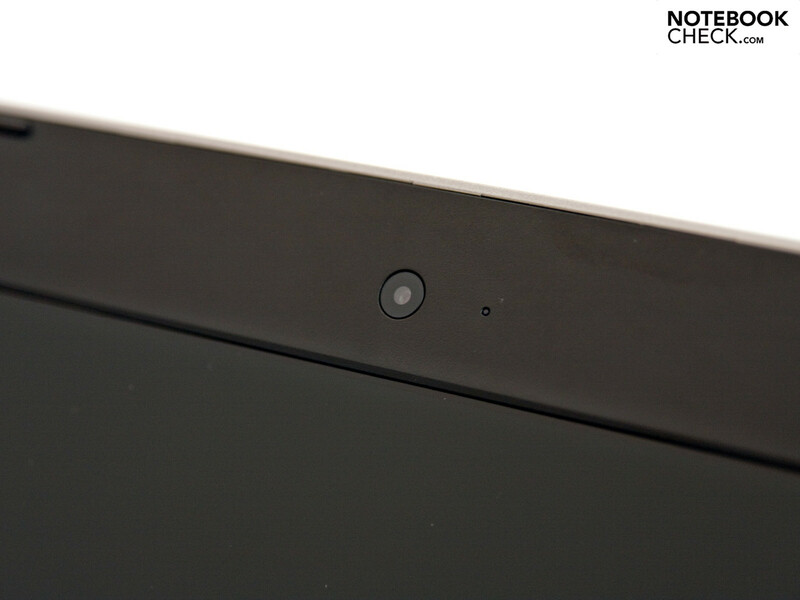 The built-in touchpad is very wide and has a slightly roughened surface, which allows easy and precise navigation. The scroll areas aren't marked. 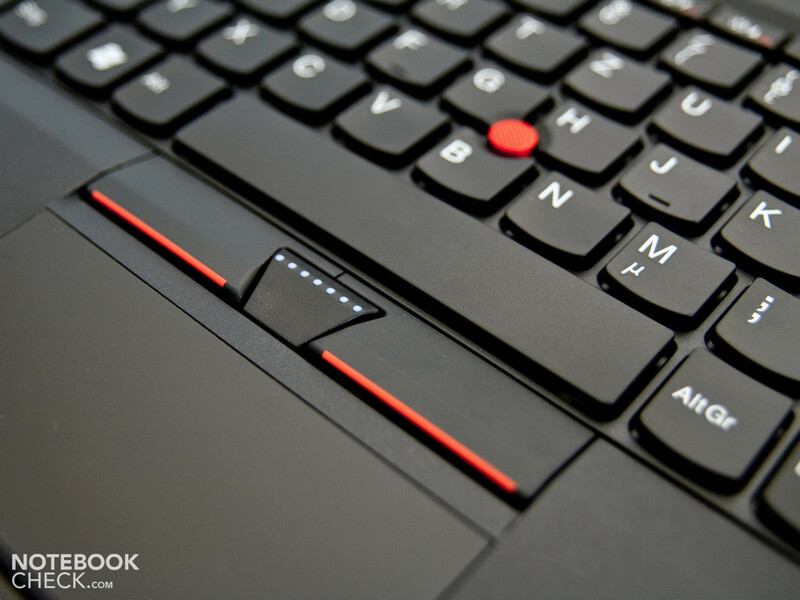 A layman will quickly notice that above the touchpad are three further mouse keys and the mandatory TrackPoint. 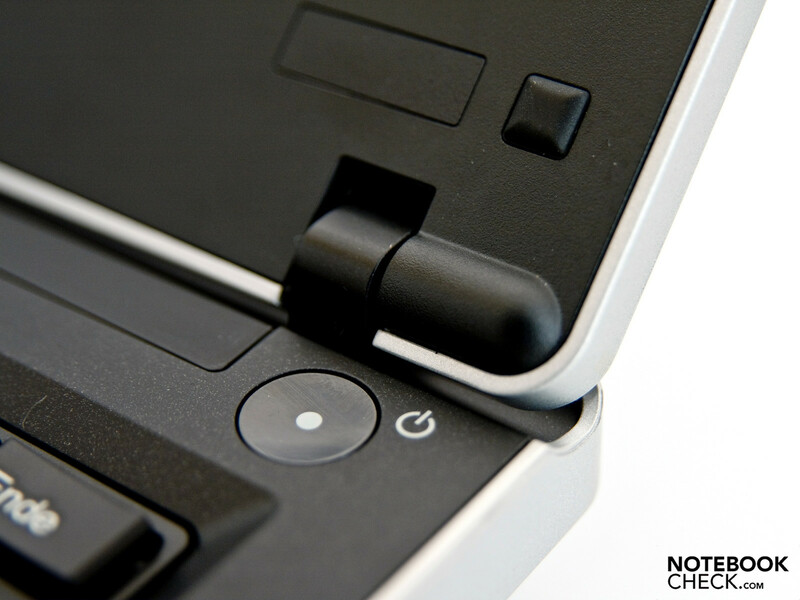 Lenovo gives a further control option with these. After a short accommodation period, you'll quickly notice that you can work perfectly with this combination. Our prototype is equipped with a 13.3 inch HD screen with an LED backlight. The native resolution is 1366x768 pixel (16:9 aspect ratio), whereby the display is also suitable for home movie use. A higher, interpolated resolution would have been appropriate for only internet browsing or word processing, so that scrolling isn't as necessary. 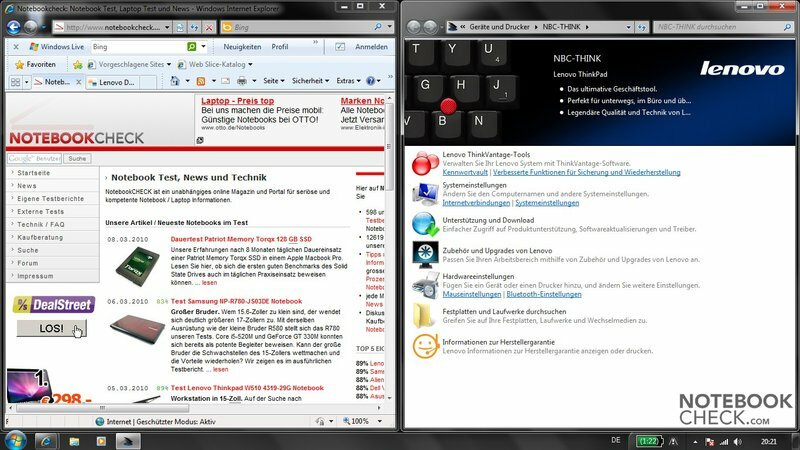 The high-gloss display is a disadvantage for a mobile business device, such as the ThinkPad 13. Unpleasant reflections that obstruct work quickly evolve. A matt display diffuses light and reduces these reflections. 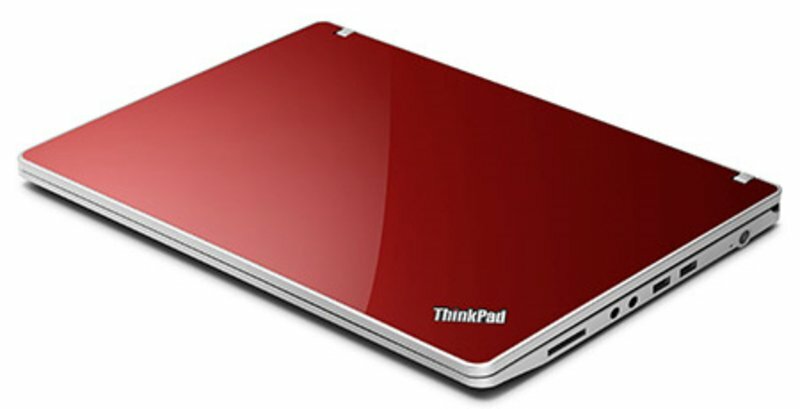 Lenovo currently doesn't have any options for the ThinkPad Edge 13 available in this matter. The built-in screen's rates are rather average. The good illumination of 93 percent and the good brightness values are on the pro side. We could establish a maximum of 209 cd/m2 in the center area. The average of all assessed rates is around 201 cd/m2. The high black value of 1.23 has to be evaluated as negative, as it has an impact on the reproduction of black and the display's contrast. Instead of a saturated black, it looks rather gray and the contrast of 164:1 is in the lower field of the notebooks we've reviewed. The color representation and image focus don't give reason for complaint. The viewing angles turn out, as expected, typical for a notebook. The viewing angle stability is fully sufficient on the horizontal plane and the colors only falsify marginally. The stable reproduction area is very tight on the vertical plane. The image and the colors are distorted already at a slight change. Thus the image looks over-illuminated from above and dimmed from below. 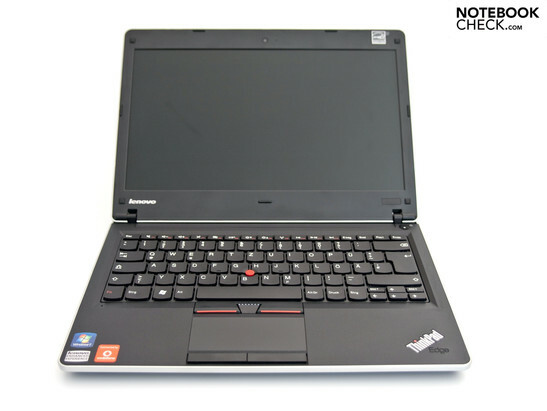 Lenovo uses an energy saving AMD Turion Neo X2 L625 processor in the ThinkPad Edge 13, which has a clock rate of 1.60 GHz. The L625 is manufactured in an older 65 nanometer structure width and as a power dissipation (TDP) of 18 watts. 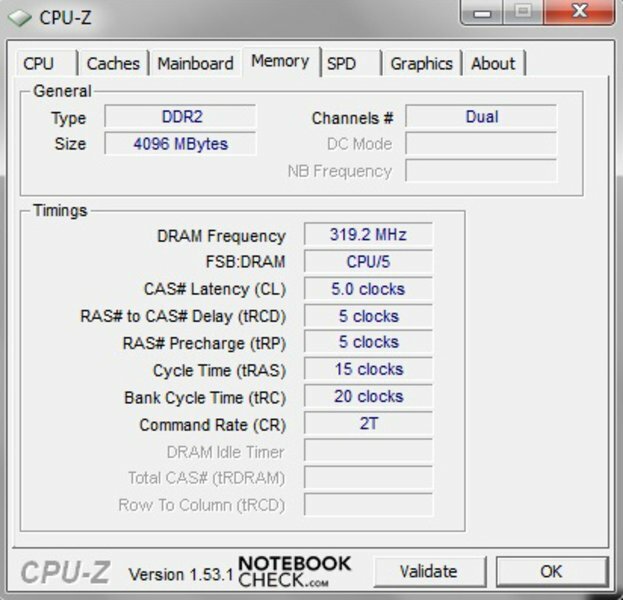 In return, a comparable Intel SU9600 with a clock rate of 1.60 GHz only consumes 10 watt. 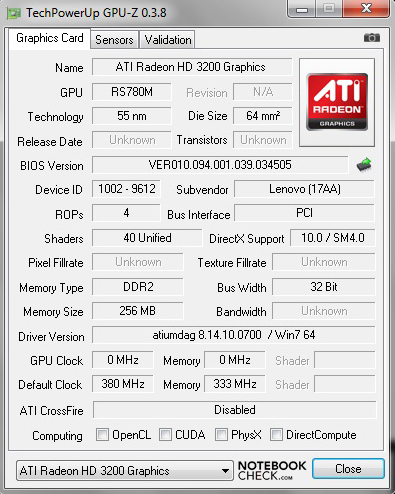 A discrete ATI Radeon HD 3200 graphic unit is responsible for the graphics in our prototype, which works with a core rate of 500 MHz. HD video rendering and decoding are supported by this combination. Aside from an AMD Turion process, the AMD M780G chip set and the ATI Radeon graphics, a 4 GByte DDR2-5300 RAM from Hyundai Electronics has been implemented. The entire 4 GBytes are addressed completely by the 64 bit operating system and can be used. 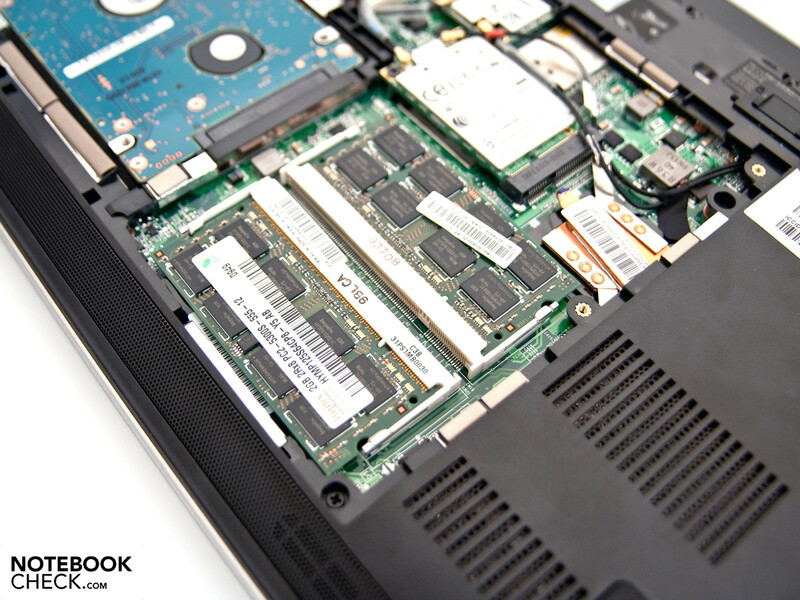 The ThinkPad Edge 13 subnotebook doesn't support an 8 GByte memory or DDR3 RAM. The RAM and the other components can be easily accessed over the big maintenance cover on the bottom. 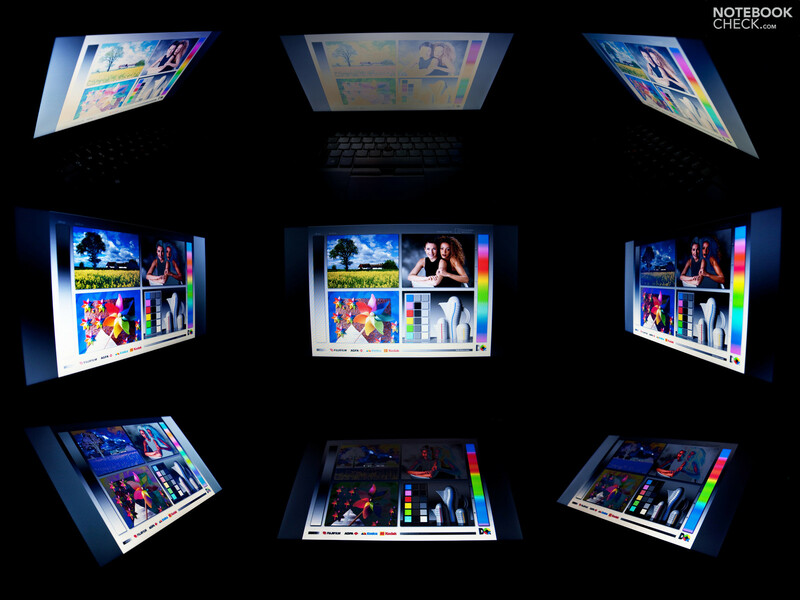 You can count with a good computing performance in the office and multimedia field with this alignment. Our prototype isn't suitable for current, 3D-biased computer games. In order to check how the Lenovo ThinkPad Edge 13 manages in detail, we've sent the device over various benchmarks. The first tests include the application benchmarks. The AMD Turion Neo X2 achieves a maximum of 1454 points in the single-core and 2798 points in the multi-core rendering of Cinebench R10. It is 1426 points in OpenGL computing. Our prototype lines itself in among various devices with an Intel ULV processor and Intel GMA 4500MHD graphic unit with these rates. The ThinkPad achieved an average of 2665 points in the PCMark Vantage benchmark and can't distinguish itself from comparable Intel systems in this case, either. The synthetic gaming benchmarks from Futuremark don't endorse good values for current gaming tracks. Our prototype only achieved 807 points in a resolution of 1280x1024 pixels in 3DMark 06, whereby the AMD processor achieved 1167 points. 3D-biased computer games are only playable to an extent if the details and resolution are reduced to a minimum. If you put emphasize on 3D performance, you should watch out for a device with an up-to-date ATI or Nvidia graphic card. The results of SuperPI, WPrime and SiSoftware Sandra stay within a limit for this configuration. The 1M calculation of SuperPi needs 55 seconds (32: 2893 seconds) and a comparable 32M calculation of WPrime is finished after 53 seconds. The AMD Turion Neo X2 L625 processor reaches a total of 9.5 GOPS in the SiSoftware Sandra 2010 benchmark (10.37 GIPS, 8.63 GFLOPS). A MJA2320BH G2 from Fujitsu has been built-in as a memory unit. The gross capacity is 320 GByte and the rotation speed is 5400 revolutions per minute. 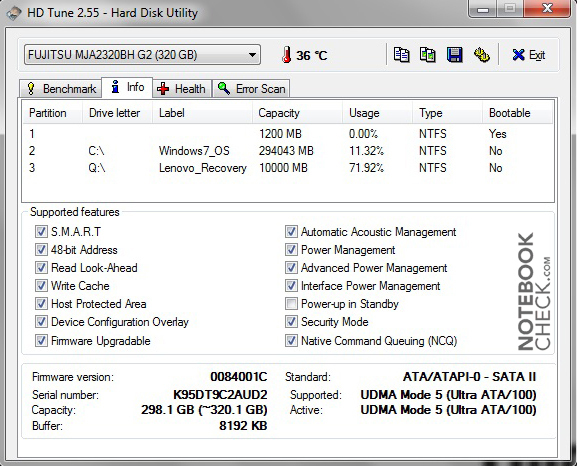 The HDTune benchmark doesn't record any unusual measurements and the Fujitsu hard disk is in the broad field of average hard disks. 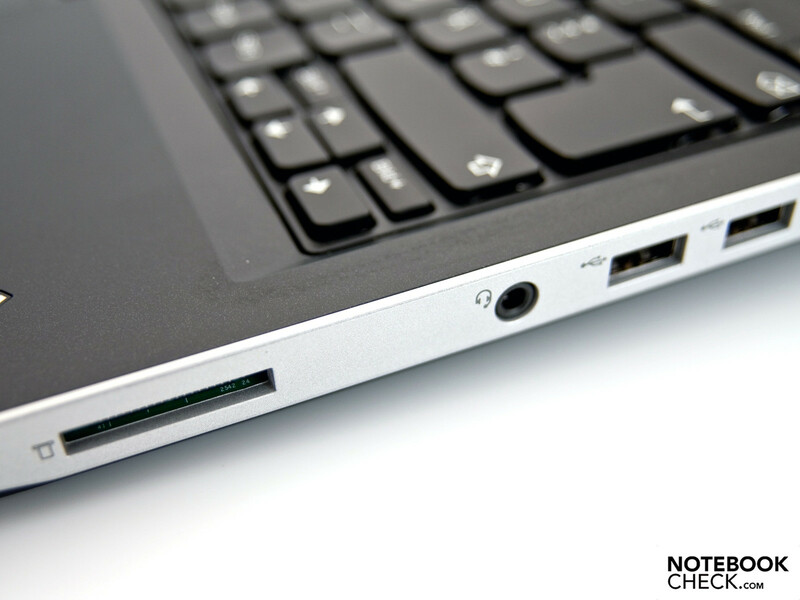 Lenovo doesn't have an SSD as an option, but every drive with a construction height of 9.5 millimeters and a size of 2.5 inches can be retrofitted with one. An optical drive isn't integrated because of the construction height and you have to fall back on a USB DVD drive, which costs between 45 and 75 euro depending on the retailer. An external BluRay drive currently costs about 150 euro. 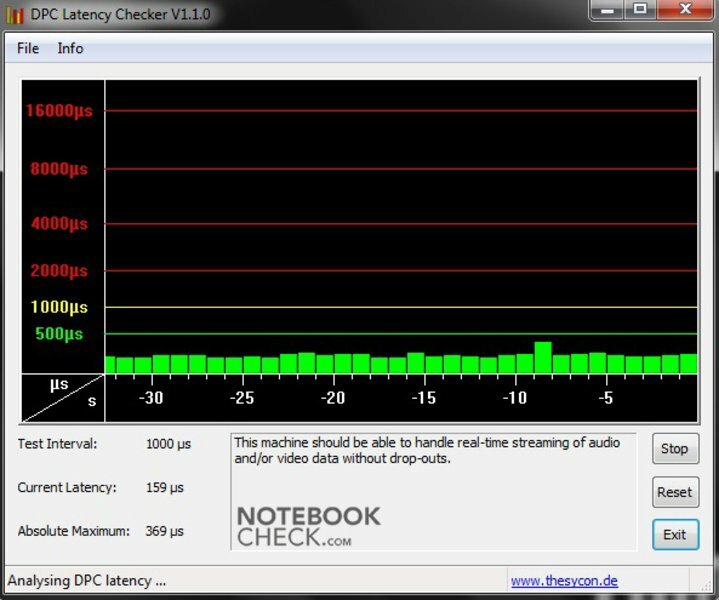 The latencies established with DPC Latency Checker remained in a green field, even after a long test period. No outliers or yellow bars turn up. So, there shouldn't be any transmission problems in synchronizing external devices, such as soundcards. In order to assess the noise development, we've measured the rates of different situations out of a distance of 15 centimeters, as always. The rates are in a normal field in idle mode and under load. We can establish between 31.3 and 32.3 dB(A) in normal use (office). The built-in 2.5 inch hard disk emits about 33.1 dB(A) at access. The rates only increase a bit under load. The measured rates under load are between 32.8 and 33.7 dB(A). The Lenovo ThinkPad Edge 13 is overall convincing in this point. 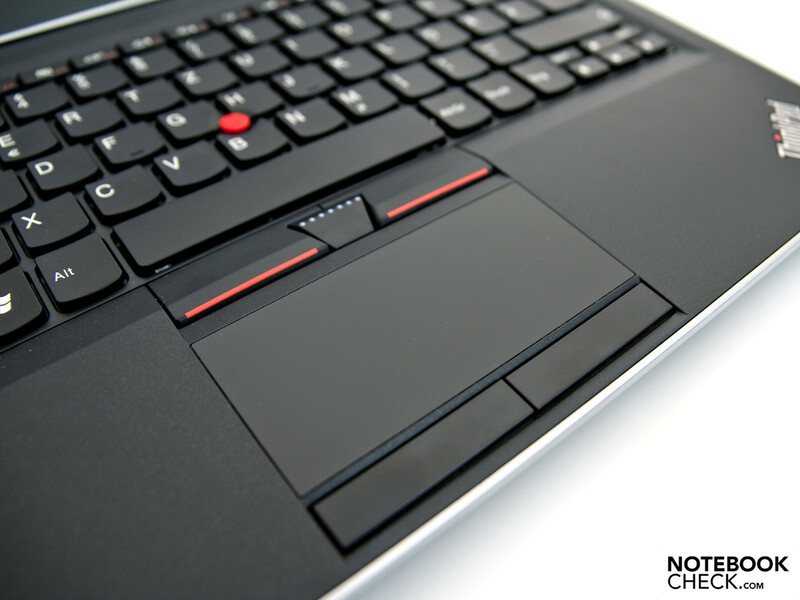 We noticed the always cool wrist-rest, touchpad and keyboard pleasantly. The rates majorly remained within a green field under a low load of the system. A maximum of 38.2 degrees Celsius are emitted on the bottom in the processor's vicinity. The base unit's upper side stay cool with a maximum of 33.3 degrees Celsius. The temperatures increase under load. To establish the temperatures under load, we executed the Furmark Stability test with a simultaneous CPU load via Prime95 for one hour. We can only record a maximum of 38.8 degrees Celsius on the bottom. 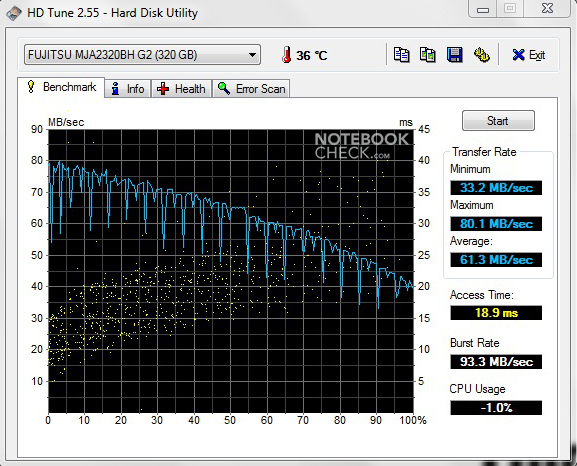 (±) The average temperature for the upper side under maximal load is 35.6 °C / 96 F, compared to the average of 30.7 °C / 87 F for the devices in the class Subnotebook. (+) The maximum temperature on the upper side is 39 °C / 102 F, compared to the average of 35.8 °C / 96 F, ranging from 22 to 57 °C for the class Subnotebook. (-) The average temperature of the palmrest area of similar devices was 28.6 °C / 83.5 F (-10.4 °C / -18.7 F). 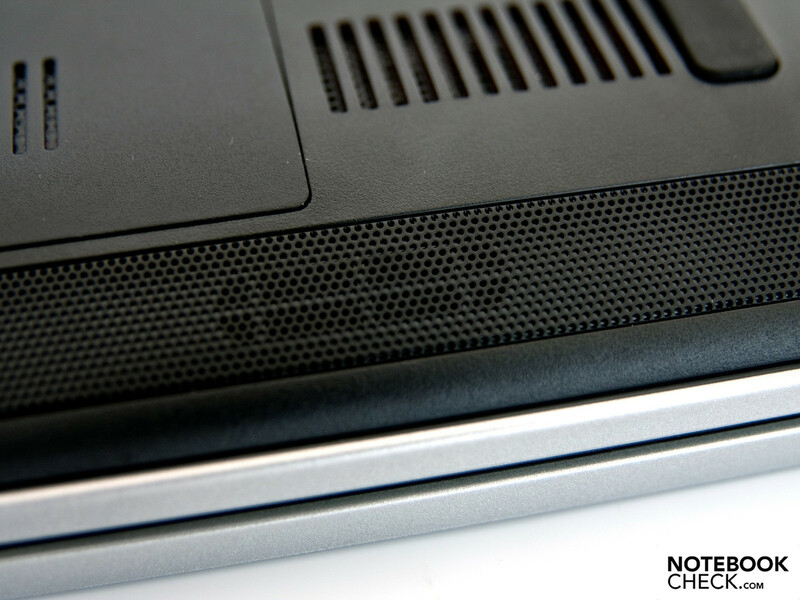 Lenovo has integrated two little stereo loudspeakers on the bottom for rendering music and VOIP conversations. The sound range is tinny, lacks bass and very fixated on trebles. For rendering music or movies in the home cinema, you should turn to external loudspeakers, which can be connected via the built-in 3.5 millimeter jack. The sound quality over this connection is significantly better. Another possibility would be a connection via an HDMI cable, which also transmits the audio signal beside the video signal. The maximum battery life is 6 hours and 8 minutes. However, the brightness is reduced, WLAN, Bluetooth, and UMTS are disabled and the energy savings profile enabled. BatteryEater's Reader's test makes it possible to read out these battery runtimes. The Classic test of the same program establishes the minimum battery runtime. That is, an OpenGL calculation with maximum brightness, enabled mobile technologies and enabled high-performance profile are run. The battery is drained after merely 1 hour and 38 minutes and the device couldn't be turned on anymore. You can surf in the internet via WLAN for about 4 hours and 25 minutes with a good brightness and balanced performance profile. A whole movie can be watched with an external DVD drive without a connected adapter. 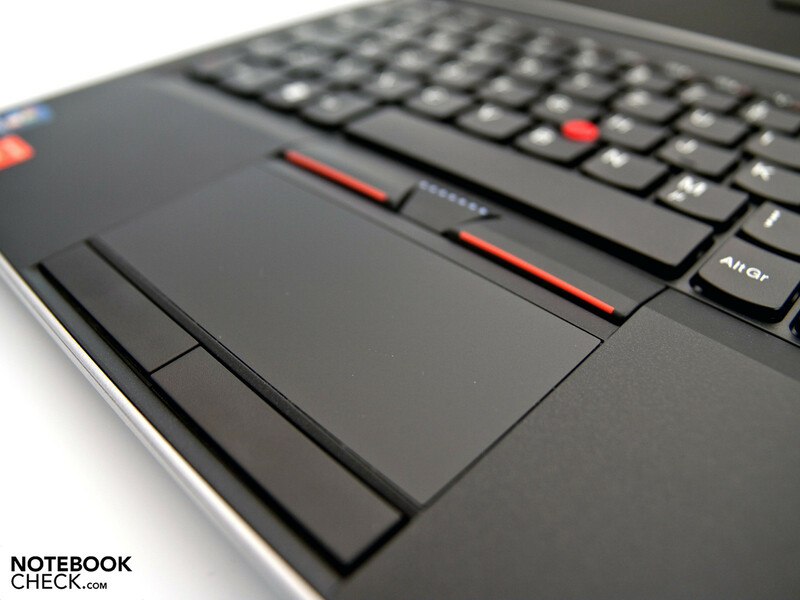 The Lenovo ThinkPad Edge 13 consumes a maximum of 37.3 watts and an average of 30.7 watts under load. The power requirement is between 10.8 and 16.6 watts in normal use. The power consumption is similar to subnotebooks that are equipped with an Intel ULV processor and Intel GMA 4500 MHD graphics. 0.7 watts are consumed in standby. The consumption in a deactivated state moves near the zero value with 0.1 watts. 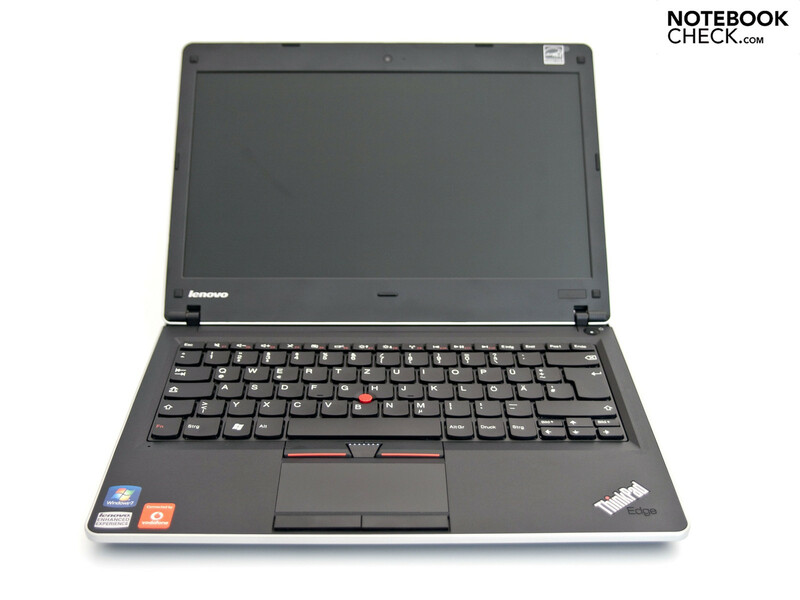 The Lenovo ThinkPad Edge 13 (NUE2UGE) that we've reviewed, generally leaves a good impression. The device's good workmanship and the display hinges are pleasing. The design is very plain, but elegant at the same time. The connectivity is quite extensive for a business device. We only miss a docking station port and an ExpressCard slot for extension cards. A further advantage is the UMTS broadband modem integrated ex-factory, which makes mobile internet use possible. The keyboard doesn't leave anything to be desired and the mouse substitute is perfectly solved with the five mouse keys, the touchpad and the mandatory TrackPoint. The hardware configuration that Lenovo has opted for is an interesting alternative to comparable Intel systems. 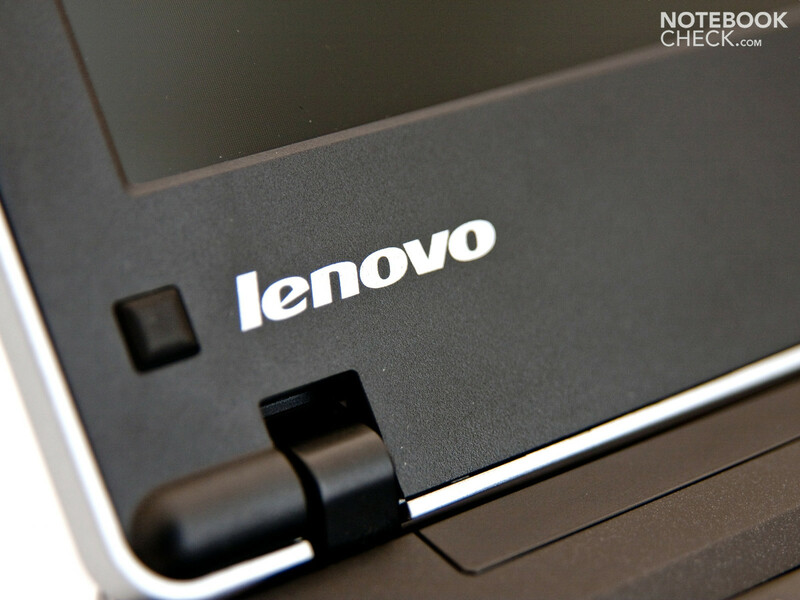 Unfortunately, Lenovo uses a glare-type screen for the Edge 13, which creates disagreeable reflections. A model with a matt display isn't available. The loudspeakers can't impress and are barely suitable for rendering movies or music. 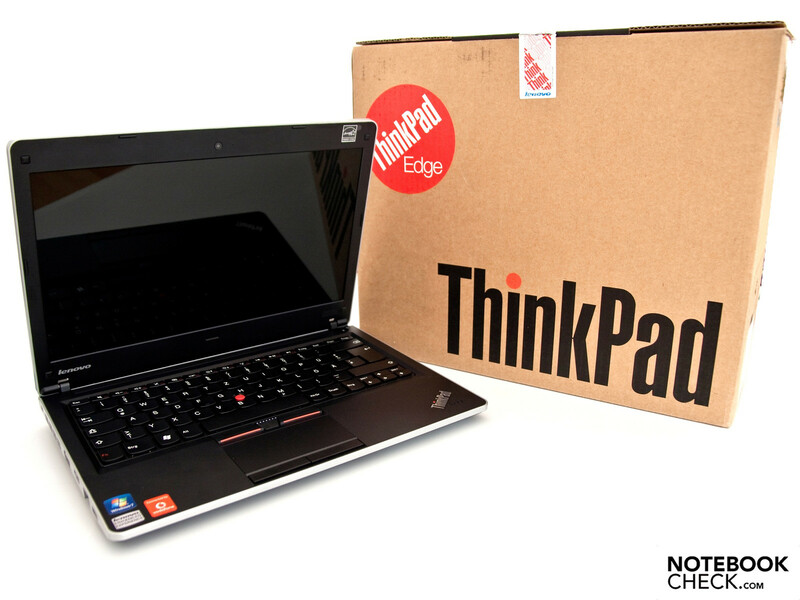 Lenovo has launched a chic business device onto the market with its ThinkPad Edge 13. It offers a good application performance and is very impressive in terms of workmanship. We miss a port for a docking station and a matt display for being able to use the Edge 13 in the professional field. If you can forgo on these, you'll get a very robust and, at the same time, a chic device with the Lenovo ThinkPad Edge 13. The price for the smallest model with an AMD processor starts at a low 678 euro (MSRP). 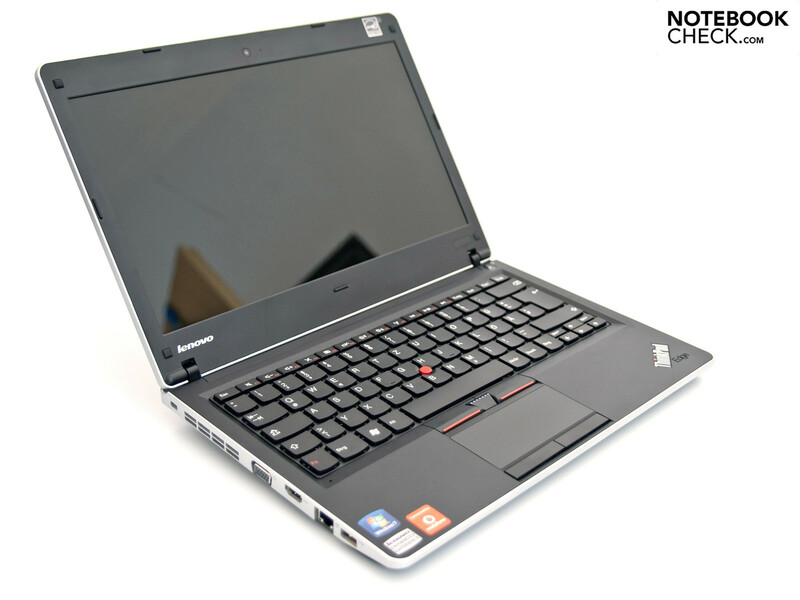 Although the overall level, for example, of a ThinkPad X300 can't be achieved, the low price compensates for a lot. A webcam and an internal microphone are also available. The big touchpad is surrounded by four mouse keys. 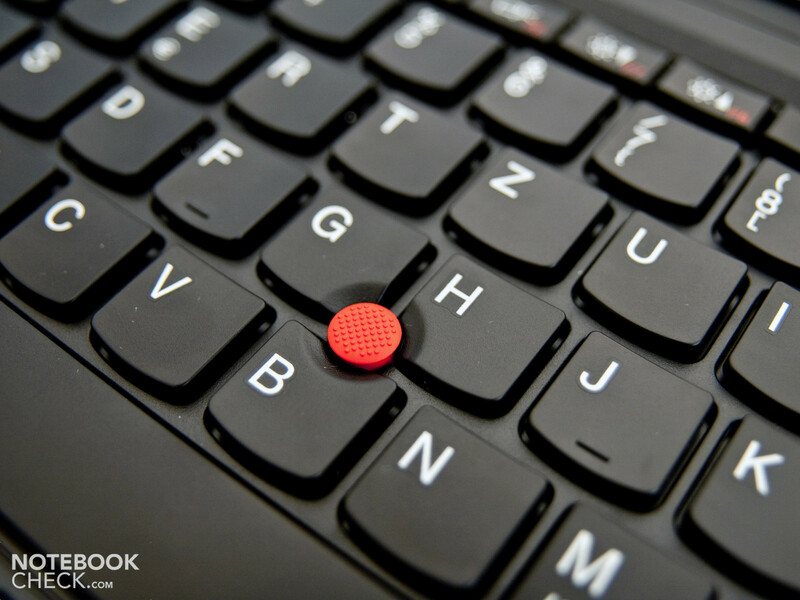 Lenovo's mandatory TrackPoint gleams in bright red and is between the keys. The industrial standard 2 mouse keys are found directly below the keyboard. ... a slight curve in every single key. 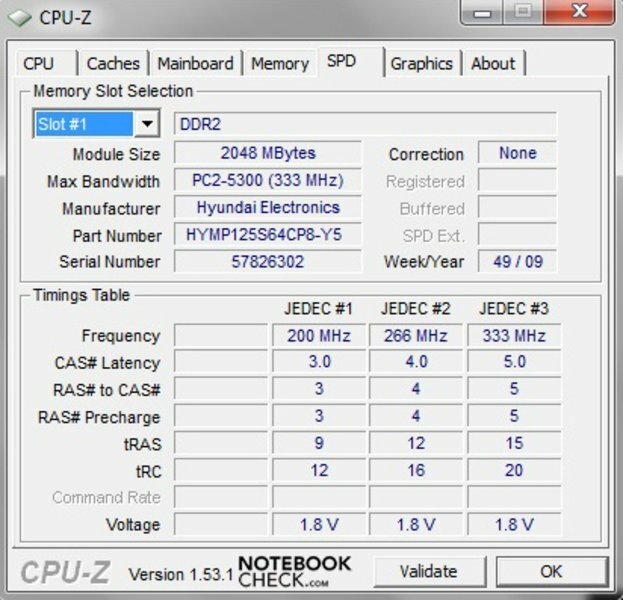 a 4 GByte DDR2 RAM from Hyundai Electronics can be found. 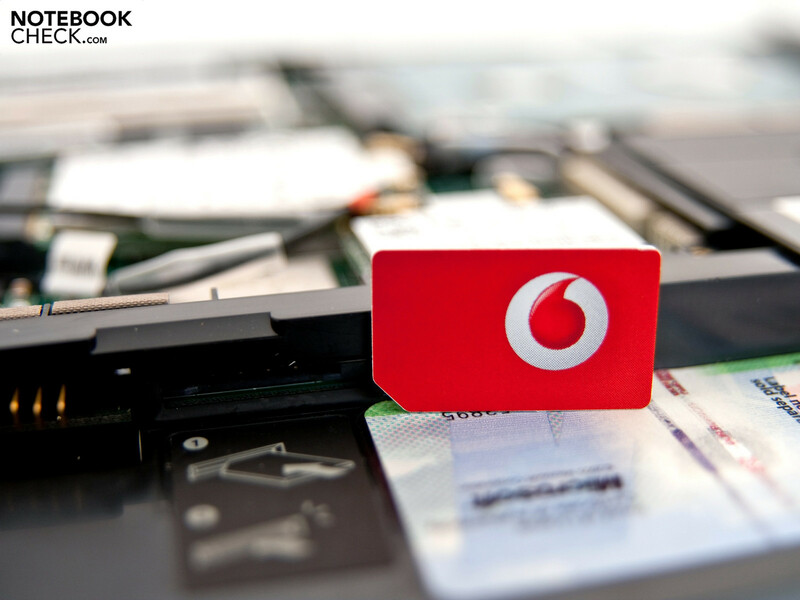 A Qualcomm UMTS modem is onboard for the mobile business routine. Two average stereo loudspeakers are underneath the front. ... and leave nothing to be desired. It even looks elegant when it's tilted. 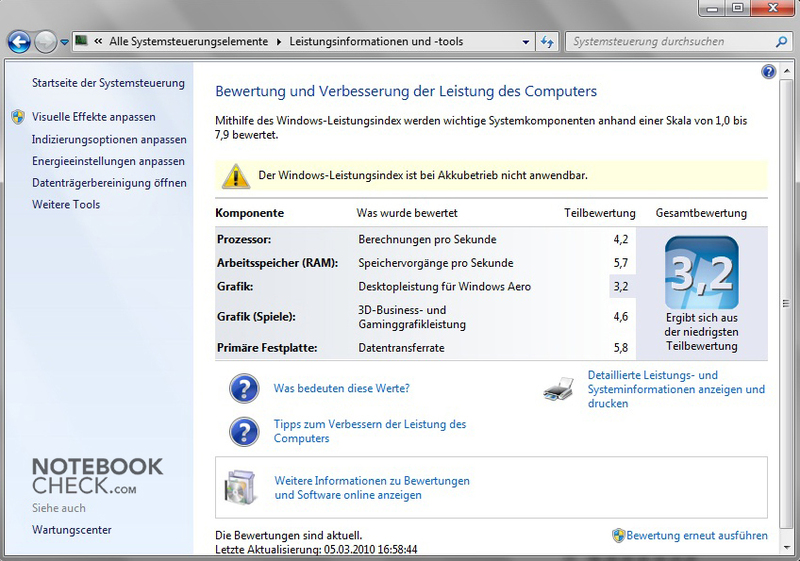 Windows 7 Professional (64 bit) is pre-installed. The lighted "i"-dot is a nice eye-catcher. ... an HDMI port, RJ-45 and a USB 2.0 port. ... two further USB 2.0 ports and the DC-in with a status LED on the other side. The included 6 cell battery has a capacity of 63 Wh. The basic design, the case's solid workmanship and especially the low starting price. An ExpressCard/34 slot for extension cards, a docking station port, and, naturally, an office suitable matt display. The integrated UMTS modem. The good workmanship for this price class and the red cover. 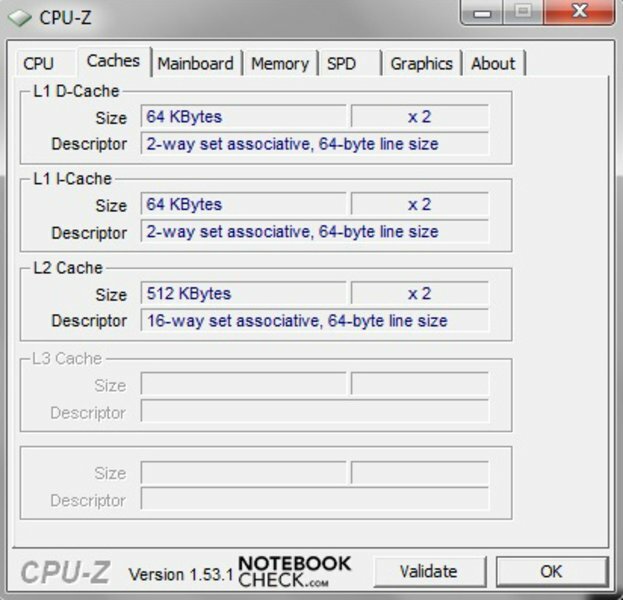 All subnotebooks with AMD or Intel ULV processor and a 13.3 inch display. Among others, the Sony Vaio VPC-Y11S1E/S, the Dell Vostro V13 subnotebook, the Toshiba Satellite T130-14T and the HP Pavillion dm3-1010eg subnotebook. The latest Apple MacBook participates in the next performance class.